Every man should learn to make a campfire. Whether it’s to cook a few sausages or to keep you warm in the wilderness, knowing how to build a fire is a fundamental, primal skill we should all know. Find a safe place to build your fire. Make sure it’s a clear spot, not on grass but built on bare soil. If there’s a designated fire spot, such as a fire pit, clear it out and use that. Create a small platform for the fire (out of dirt will do) that’s about 10cm thick. 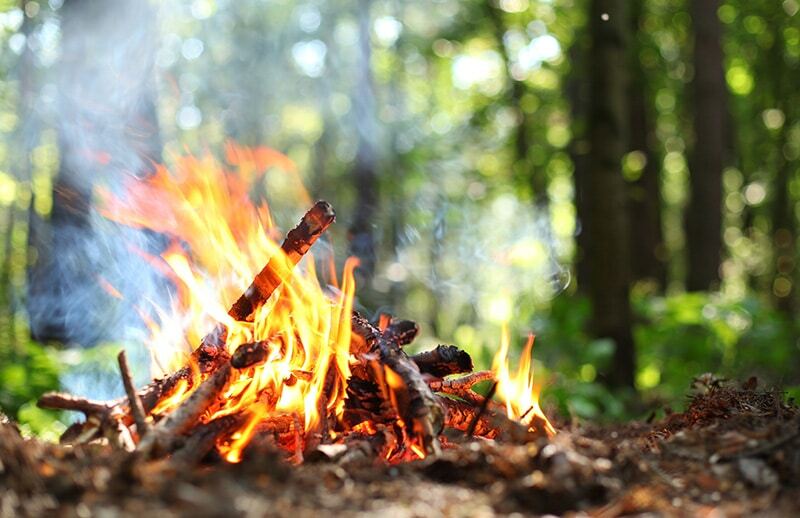 There are three different types of wood you’ll need to collect to start your fire – kindling, tinder and fuel wood. You use tinder to kick start your fire and it should be very dry wood that catches on fire easily. Dryer lint works well, or dry leaves or wood shavings can work too. Kindling keeps the flames licking and it needs to be small enough so it doesn’t put out the fire altogether. Small, dry twigs and branches also work well. Fuel wood is what keeps the fire burning for hours. The logs should be about as wide as your forearm and not too much bigger, otherwise they could take too long to ignite. You can choose to lay the wood bundle like a tepee, with the tinder in the middle of the tepee with an opening at the top for the wind to flow through. Once it’s alight, add the kindling and build it up to the fuel wood. Make sure you put the smaller pieces of fuel wood down first, building up to the larger blocks. Keep your beard a safe distance from the jumping embers! Once you’ve enjoyed your fire time, you need to make sure you put it out properly so it isn’t left unattended. Sprinkle water over the fire pit slowly, rather than drenching it in water, as this will make it easier to light another fire in the same spot the next time round. Make sure you stir and stick the embers with a shovel to ensure all the ashes cool down with the water. When you think the fire is pretty much extinguished, make sure you put your hand above the embers and if you don’t feel any heat, you’re good to go.